Born and educated in Johannesburg, South Africa. After Yeshiva studies completed medical school in Cape Town (Grootte Schuur Hospital). Came to Israel in 1979 on completion of studies and did an internship and Family Practice residency in Israel, through Hebrew University. Served in the Israel Air Force as a flight surgeon for 18 months. Special interests in medicine include pediatrics and family dynamics. Father to six children, two grandkids, one dog and two parakeets. Enjoys the outdoors, and spends what free time he has on cycling, studying Talmud and field trips in Israel. Our highly skilled English-speaking Primary Physicians, Nurses and office staff speak your language and understand your concerns. We work with many medical insurance programs and our English-speaking administrative staff can guide you in this area. We can help smooth the way through the bureaucracy. Payment is simple, as we accept all major credit cards. Expertise, warmth and easy accessibility have made the Family Medical Center – Wolfson one of the leading health facilities in the country. 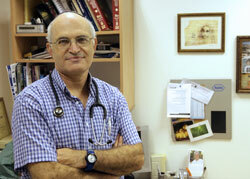 One of our doctors can be your family doctor while you are away from home.